Artist: Alden Olmsted - Panorama Framing, Inc. 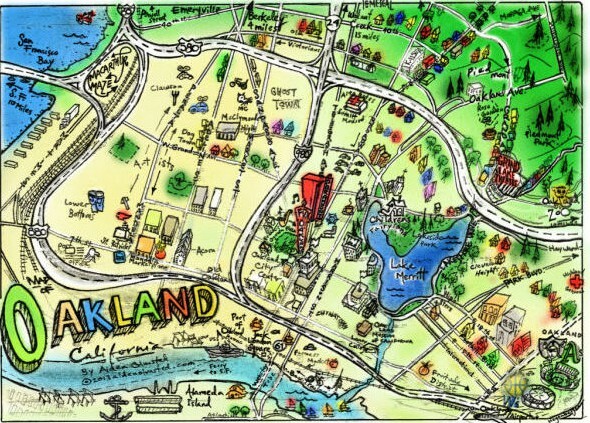 Taking a break from screenwriting in late 2009, Alden began to look through some of these old drawings, finding maps of towns and directions – drawn for friends prior to the internet. It occurred to him these were too intricate and interesting to be sitting in a file somewhere so Alden took a few samples and began sending them around, and after a few tweaks – like adding color (!) he received nearly unanimous interest and support. Currently the maps, of more than 20 cities and states, have found their way onto postcards, notecards, magnets, posters, and T-Shirts, and are available at over 75 locations around California, including prominent spots like The Getty Center, Griffith Observatory, Muir Woods and of course, Panorama Framing Inc.